Do your household products or kids’ toys have scary stuff in them? Have you wondered if your children’s toys or clothing, your bedroom pillows or living room cushions have flame retardants or other hidden toxics in them? 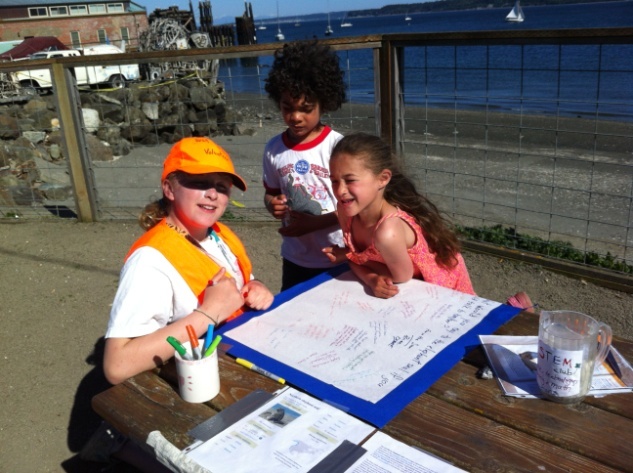 The Port Townsend Marine Science Center (PTMSC), in partnership with the Washington Toxics Coalition, is holding an ”X Out Toxics” event on Saturday, July 13th from 11 a.m. to 2 p.m. so you can find out. Bring your items to the Natural History Exhibit at Fort Worden State Park and get them scanned by an XRF Analyzer. The event is free with standard admission to the exhibits: $5 for adults, $3 for youth and free to PTMSC members. The portable XRF Analyzer, formerly confined to laboratory use, safely uses x-ray fluorescence to detect certain chemical elements such as lead and other heavy metals, bromine (indicating the presence of brominated flame retardants) and chlorine (indicating the presence of PVC/vinyl). Are you interested in helping with environmental research? The Port Townsend Marine Science Center (PTMSC), in conjunction with scientists at the University of Washington Center for Urban Waters, is leading a study of toxic chemicals in roof runoff. PTMSC is looking for 10 to 15 Port Townsend area residences where water samples can be taken from their roof during a rainfall. They are also seeking volunteers who can be trained in advance and then collect water samples on short notice. PTMSC initiated this study, funded by an Environmental Protection Agency (EPA) Urban Waters grant, as part of its focus on toxic chemicals that are part of everyday activities. The Puget Sound Partnership identified toxics in roofing materials as a suspected contributor to stormwater pollution in its 2012 State of the Sound. Roof runoff often flows into storm drains, contributing any pollutants directly to marine waters. Samples will be analyzed for a panel of about 35 chemicals, including many hydrocarbons and chemicals called phthalates that are found in plastics. 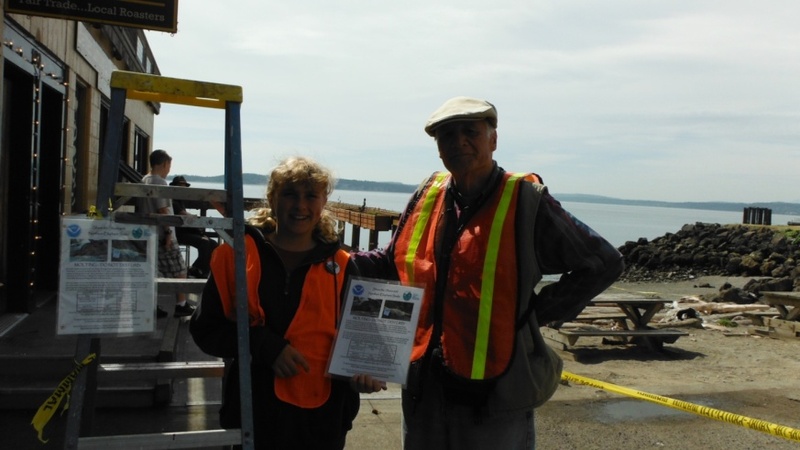 PTMSC will also train Seattle Aquarium volunteers to provide similar testing in the city. If your house has been built or re-roofed with composite (‘three-tab”) roofing material within the last three years and has metal rain gutters, PTMSC would like to hear from you. Sampling materials and training will be provided and volunteers will receive test results. For more information, contact Jamie Landry, Citizen Science Coordinator, at jlandry@ptmsc.org or call 360.385.5582, ext. 112. My mom and I were taking a morning walk downtown. We had just eaten a wonderful breakfast at The Bayview Restaurant. Stopping at Adam’s Street Park, I sat on a bench and studied a butterfly that had landed on a nearby flower. My mother was standing at the rail looking out at sea. She scanned the beach casually, but then her head jolted back and she stared intensely at one spot. “Ella,” she whispered urgently. I went over to see what had caught her eye. I walked to her side and followed her gaze. All I saw at first was a beach covered in driftwood and logs. Then to my surprise, one of the logs moved! That’s when I realized it was a very sandy seal!!!! You would have to know that I live half the year in Hawaii. There, the endangered Hawaiian Monk Seal hauls up on beaches too. Whenever a Monk Seal hauls itself on a populated area of one of the main islands, marine biologists rush out and put yellow tape up that says: Protected Marine Mammal - Share the Beach! 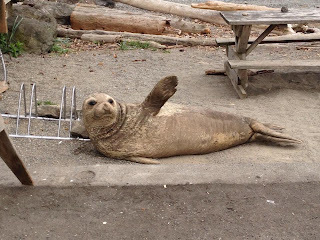 Here in PT, the Marine Science Center works to alert the volunteers of the local Marine Mammal Stranding Network. They organize the volunteers, who then take shifts watching the stranded mammals, and educating people about them. Seals can be dangerous to people if harassed. People can unfortunately be dangerous to seals too. 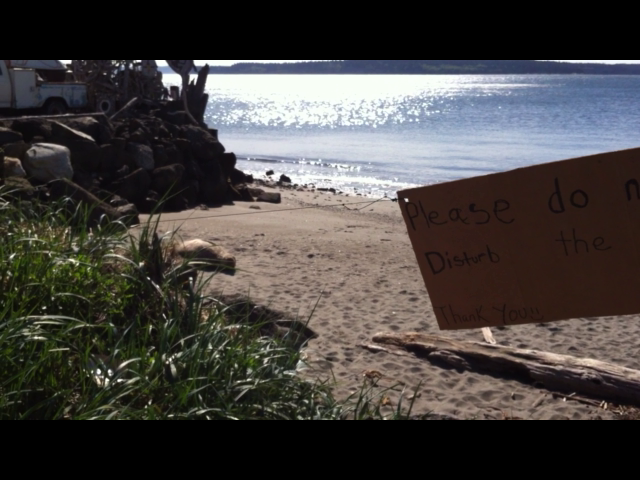 Please Do Not Disturb the Seal!!! In the meantime, my mom had called the Port Townsend Marine Science Center to alert the Marine Mammal Stranding Network. Since the Marine Science Center had not arrived yet, my mom called the City Hall to see if they had any yellow tape that kept people back. 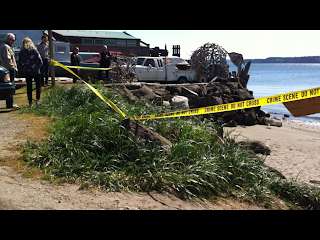 The City Hall contacted the Port Townsend Police Department and asked them to help. In the meantime, people passing by asked a lot of questions: “Why doesn’t it have any spots?” “Is it lost?” “Is it dead?” As we tried to look up answers, a police car pulled into the parking lot. Unfortunately, because the police put up yellow tape that said, “Crime Scene – Do Not Cross,” even more people came! Rumors circulated that someone had shot the seal or that the seal had bit a girl! You would not believe the stories we heard! After securing the perimeter, my mom and I hung the sign I made. We decided to stick around until we heard from the Marine Science Center. I was glad we did, because soon after, we faced another problem: As the time was nearing nine o’clock, the town was getting busier. The beach that the seal had pulled up onto was a popular sea glass collecting and dog walking area! The problem was that the seal had pulled up right next to a side trail that leads down to the beach. I stopped people left and right explaining why they couldn’t go onto the beach. One time, I even had to interrupt a man’s phone conversation. A moment later and he would’ve been standing on the seals head. I don’t think that would have gone well with the seal…Throughout the week, because the seal hauled up in a “downtown area,” there were lots of people taking photos! I sure wish I had some of those great shots from those long lenses!!! Harbor Seal or Northern Elephant Seal? Before the volunteers arrived, I was researching seals of Puget Sound on the internet using my mom’s Iphone. We found that the most common seals around here were called Harbor Seals. This seal was about the same size as an adult male Harbor Seal, which is about five feet. 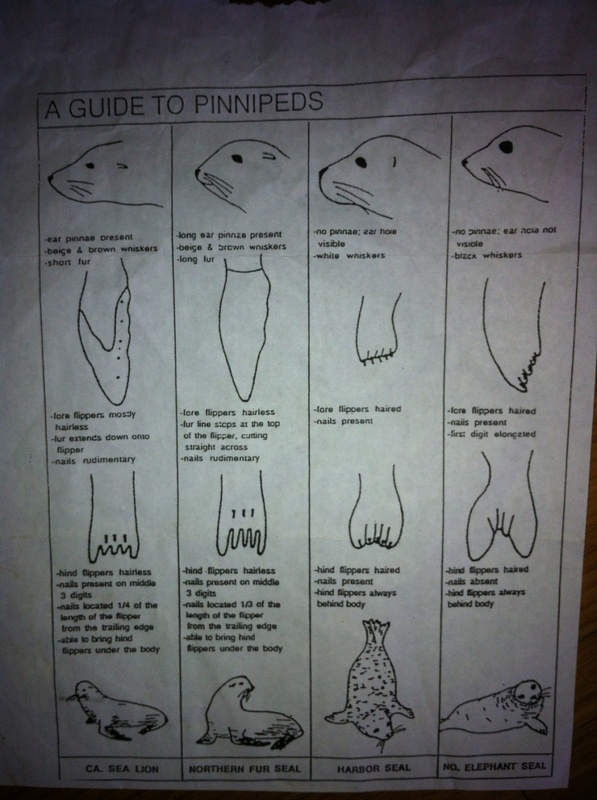 The only difference I could see was that it had no spots as Harbor Seals usually do. I looked closely at the seal and saw that the skin and fur looked like it was peeling off. “The seal must be molting” I said. 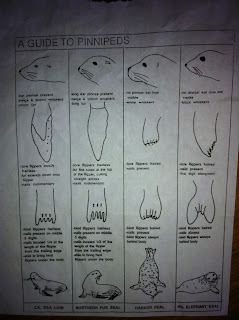 I had just read a Wikipedia article about molting seals. Molting is where a seal sheds its fur and skin. The process can take four to five weeks and the seal is especially vulnerable during this time. Shortly afterwards, another volunteer named Roger arrived. By then, I had decided to stay the entire day. I felt that it was my responsibility. Roger came by to “seal sit” and I liked him at first sight. We talked to people about the seal that whole day and even if I didn’t know it at that time, I would be “seal sitting” every day for the next 14 days. Sometimes it was hard getting people to listen to me. Not all people wanted to listen to a kid. 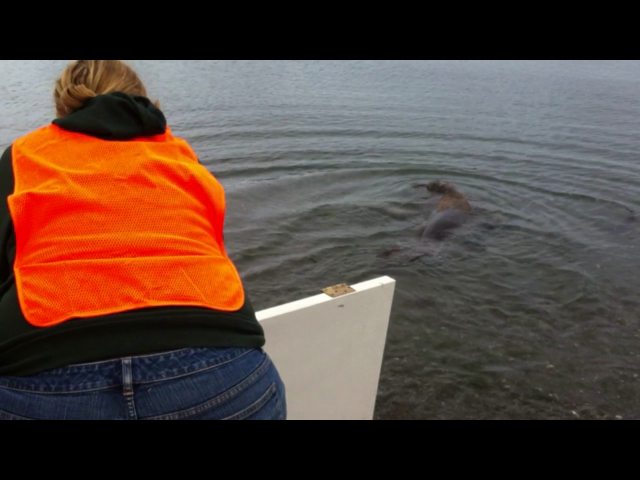 Later on, when I got an orange vest from the Marine Mammal Stranding Network, it was easier. It made people treat me like I was a professional. I already had leadership roles through 4-H. In my 4-H PT STEM (Science, Technology, Engineering and Math) Club, I begin every meeting by pledging to serve my community. 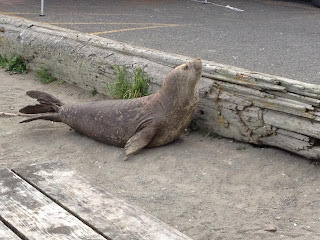 This “seal sitting” turned out to be a very natural role for me to serve Port Townsend in. I started thinking about ways to engage kids and adults. One of the fun projects was “Story Time with Star.” I made a reading nook so that kids could read stories to the seal while it swam nearby in the water or rested near the shore. It gave kids something quiet to do while watching the seal. I had a lot of wonderful books to share about sea animals from Hawaii. One story was even about a Monk Seal, and seal sitters! I also made posters asking people to write down questions they had for the seal. 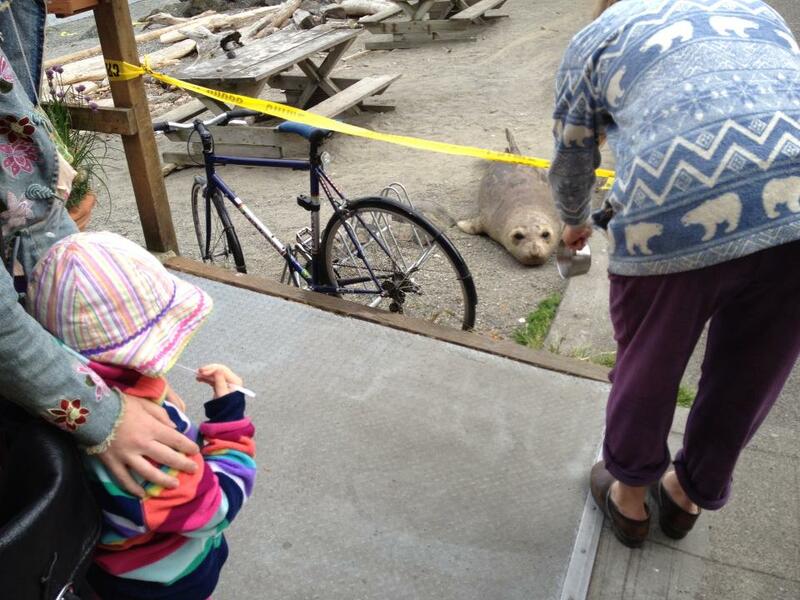 I think it made people feel better, just being able to “talk to the seal.” A lot of people were worried that the seal was sick. The days flew by after that first day. I was there every day and a few nights too. The community became so attached to the seal we even named him. His name is Star. I felt like the name fit, he was the “star” of Port Townsend, that’s for sure. Star and I even got our names in the newspaper. 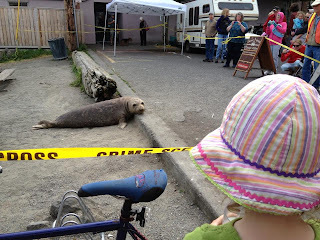 It felt like the whole City of Port Townsend saw him at least once. Some citizens even became daily visitors to make sure he was okay. My biggest worry when I was away was that something would happen to him. He had an unexplainable desire to “window shop” downtown! One day my brother Nathaniel and I were at a wood working class at the Maritime Center. Our class had just ended when my other brother Everest came running up. “Ella, Emergency! Emergency! The seal needs you!! !” my brother shouts. That’s all the information I needed! I began running in the direction of the seal. I had thought the seal was at Adam’s Street Park but he wasn’t there! Where could he be I wondered? Then I remembered that he sometimes goes to a beach near a coffee shop called Better Living Through Coffee. Before the thought had fully formed, I was of running as fast as could. Millions of horrible thoughts raced through my brain. 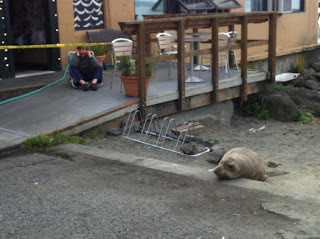 A few days before, Star had gone to the beach near Better Living Through Coffee’s and even pulled up on the side walk. What if he climbed further and got run over by a car? When I got there, I tried to make sense of what I saw. My Mom and some volunteers were standing in a crescent shape holding old doors as a barricade. They were facing the water and trying to corral something back to the beach. Suddenly, I understood. The seal had made it all the way to Water Street! And, it was trying to cross over! The volunteers were following the newest NOAA protocol and “crowd boarding” him back to the water. I couldn’t believe it! 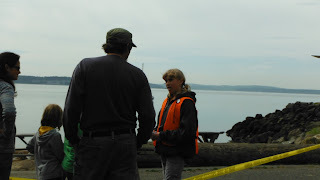 The volunteers were trying to corral a three hundred pound seal back to the water!!! I badly wanted to help the volunteers. I knew I couldn’t help them corral him. There had to be something a 12 year old could do. Then I saw a volunteer trying to keep the crowd back and corral the seal at the same time. Things were getting crazy. I grabbed the yellow tape and pulled it back so the volunteers had room. Star finally gave up and reluctantly inched his way back towards the sea. A cheer erupted from the crowds when he finally entered the water! Star eventually swam back to the Adam’s Street Park Beach. He tucked up under Nifty Fifty's restaurant again. After a couple of days of rest, Star left. I was sad and happy at the same time. I was happy because Port Townsend wasn’t the best place for him. Star had endured stinky cigarette smoke, grimy engine oils, noisy generators, toxic herbicides, AND a bunch of bossy girls pushing him back into the water (that last insult must have been the worst for a male elephant seal!) But, I was sad because I had developed a bond with him. Releasing a wild animal is the hardest part of being a Wild Animal Rehabilitator. I will always remember the experience “Star the Seal” gave me. Star was amazing because he drew everyone in, no matter their differences. 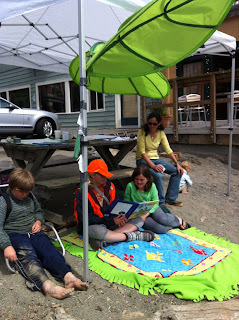 I think he truly found a home in the heart of Port Townsend. I would like to thank all the businesses that helped support the Port Townsend Marine Science Center “seal sitters.” : Pizza Factory, Elevated Ice Cream, Nifty Fifty, Better Living Through Coffee, Jordini's, Fins, Waterfront Pizza, The Clothes Horse, Dons Pharmacy, Boiler Room, and the Maritime Center. 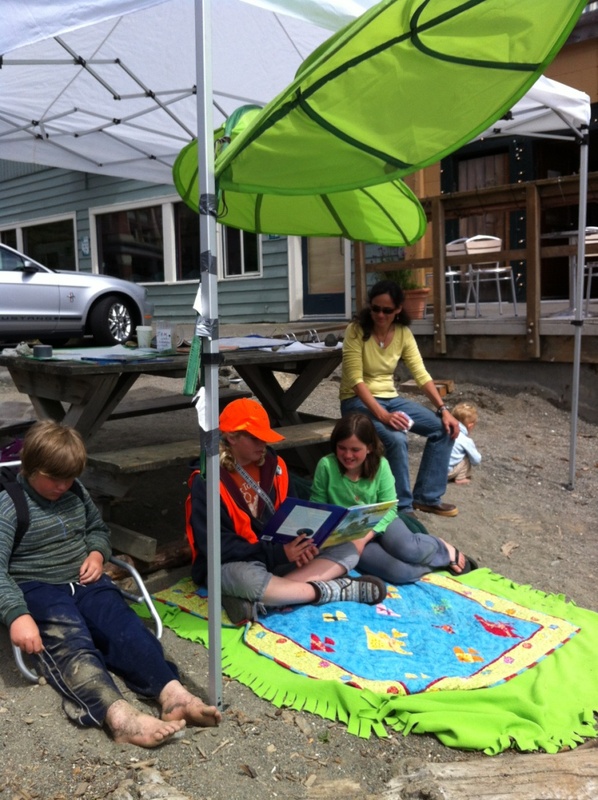 And a special thanks to the Community of Port Townsend!!!! All marine mammals are federally protected under the Marine Mammal Protection Act. NOAA advises people to stay 100 yards away, if possible, and do not touch, handle, or feed marine mammals.